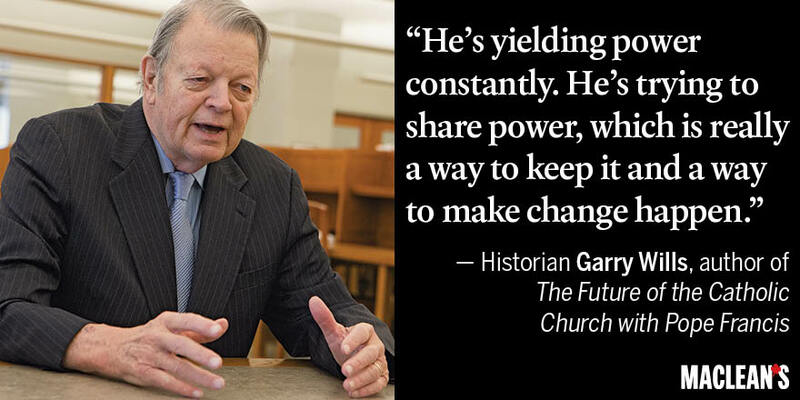 In a wide – ranging interview with Macleans magazine, Wills explained why he was enthusiastic about the change in style being introduced by Pope Francis, and why these will in time become entrenched as permanent features of the Church. Francis’ willingness to stimulate debate and tolerate disagreements, he says, are a sign of his strength. He contrasts this with Pius IX, whose proclamation of papal infallibility he sees as a sign of weakness, not of strength. I think the assertion of power would be a weakening thing for Francis, and he hasn’t done so. Instead, he’s yielding power constantly. He’s trying to share power, which is really a way to keep it and a way to make change happen. The importance of what Francis is doing, is that he is allowing (even encouraging) change to emerge from the bottom up..We already know that in so many areas of Church practice, what happens on the ground, in local parishes, is markedly different from what is laid down in Vatican rules. 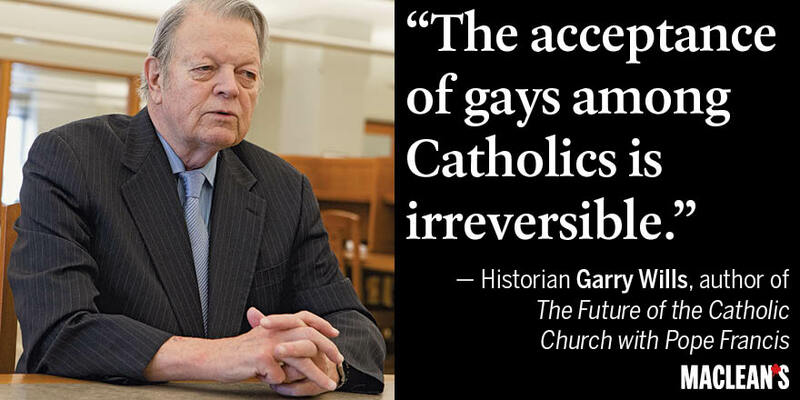 It’s in that context, for example, that he claims that Catholic acceptance of gays is irreversible. In the same way, he points out that while there has been little sign of increasing inclusion of women at the top of the church, the situation at lower levels is very different. He gives the example of the prominent role of women in university chaplaincies. Much the same would apply to teaching of theology, parish and diocesan administration, pastoral councils and Catholic schools, hospitals and charitable organizations. A: I think that was the underlying message. Francis, like all Third World people, is very much against colonialism and, in saying the ban on contraception was spiritual colonialism, he was saying that when it’s no longer looked at that way, as colonialism, then it won’t matter, then the teaching will be downplayed and ignored. The underlying message presented by Wills, is that in historical terms, there have been numerous changes in church teaching over the centuries – examples he quotes being opposition to usury, and to democracy. But neither of these changes came about as decrees from above. Instead, they simply became accepted by ordinary people in their daily lives, and the hierarchy stopped opposing them. On the ground, there is already widespread Catholic acceptance of contraception, cohabitation before marriage, female participation in ministry, and inclusion for gay and lesbian Catholics, and for the divorced and remarried. It will take time, and the pace of change will vary across the globe, but under Francis’ bottoms-up revolution, says Wills, we should expect the acceptance of realities on the ground to influence further the thinking at the top. In time, pastoral practice will determine doctrine – just as the historic church learned to accept the value of charging interest on loans, and to promote democracy, instead of fiercely opposing it.